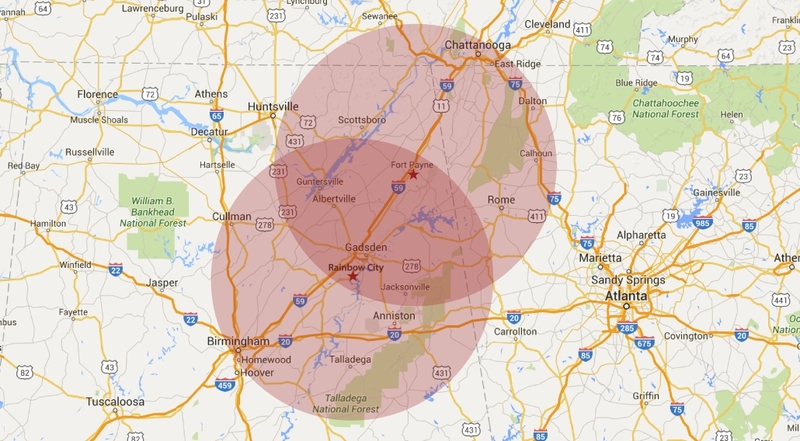 Ancro has been servicing areas within a 100 mile radius of Fort Payne for several years. We are now servicing areas within a 100 mile radius of Gadsden, AL. The primary counties we serve in Alabama are DeKalb, Cherokee, and Jackson. Some of the cities we serve include Albertville, Boaz, Centre, Dutton, Fyffe, Gadsden, Gaylesville, Geraldine, Glencoe, Henagar, Leesburg, Oxford, Rainbow City, Scottsboro, Section, Southside, Sylvania, and all cities in Alabama, as well as Rome, Georgia and Chattanooga, Tennessee and of course Fort Payne and several others. We have a large database of customers in all of these areas and are well pleased to have expanded our boundaries into these neighboring cities. It is Ancro’s goal to become the largest door and window dealer in the Southeastern United States and we are well on our way. We pride ourselves in selling the highest quality products at the most competitive prices with a fantastic technical team and polite and friendly sales staff. The truth is you just can’t beat quality when it comes to products or people and we are fortunate to have both.